It's been one year since I had surgery to remove a brain tumor. Sports Shooter asked me to write a follow-up of the past year. I had a great recovery from the surgery and the rehab was smooth and quick. I felt great. Since a small portion of my tumor could not be removed because of its location, I have to continue to have MRI's to monitor its size. It has remained constant. I feel that the tumor will not grow in size and that I will not have to make any decisions about chemotherapy and/or radiation. Then, on July 20th, while I was driving home, everything in front of me turned sideways and looked twisted and I went into a seizure. I remained conscious. I knew what was happening. My left arm and left leg went straight and began shaking violently. I knew I had to stop my car safely. Luckily, I was driving slowly and only a few blocks from home. Using all of the strength left in my body, with my right arm and leg, I braked the car, pulled over to the side of the road, and stopped my car. The feeling began returning to my leg and arm in about 20 minutes. I was then put on anti-seizure medication. I continue to have seizures which come about one once a month. I am now on my fourth different medication (the first three made me feel awful and did not work). My last seizure was May 9th. Over the past ten months, I have had difficulty dealing with the fact that I was having seizures. There is no pain associated with them. It is more a psychological thing. I never expected to have seizures and it was a tremendous shock to me when they began. Not being allowed to drive causes another major impact in my life. I have been driving since I was 16 years old. The feeling of independence associated with driving is gone. This affects my ability to work as a free-lance photographer. I hope to be able to drive again sometime in the future. But every very time I start feeling sorry for myself, I think about all of the people who have really severe problems and illnesses. My situation is very insignificant when you look at the big picture. I am very thankful for what I have. I feel that this is the right time to make some changes in by career. It is time for me to stop the daily routine of being a professional photographer. This is a decision I have just made. Everyone will be faced with that decision at some point in their lives. For me, it is now. I would rather stop taking photographs a little early, when I feel that I am still able to shoot good photos, than to keep shooting too long and watch the quality of my photos decline. I love photography. I will continue to do some photography --- photography just for the joy of it, not as work. I enjoy shooting NFL football and I will continue to do that as long as I am quick enough to avoid 249-pound tight ends. I have had many exciting experiences over the years as a professional photographer-- everything from shooting photos from the very top of the Golden Gate Bridge to shooting several World Series and Super Bowls. I have had my "15 minutes of fame" which was stretched a bit last year. I've met, and gotten to know, many wonderful photographers throughout the country. There are many excellent photographers out there, many just beginning their careers. 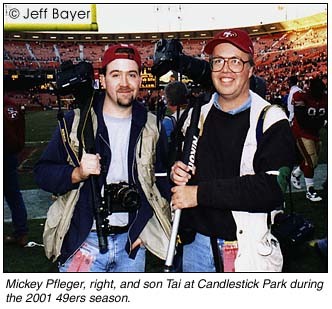 I have been very fortunate to be able to share the sidelines at Candlestick Park with my son Tai, 23, who began shooting games when he was 13 (He has a real job during the week, which isn't such a bad idea these days). He has had a photograph of his published "double-truck" in Sports Illustrated five years ago (this is a proud parent talking). I want to spend as much time as possible with my sonTai, his wife Ora, and my daughter Amanda. This past year I didn't shoot many assignments. The assignment photographs which I have accumulated over the years provided me with the income I needed to pay most of my bills. Over 90% of my income last year came from those photos that are in my files. I own the rights to every photograph I have ever taken (these are my words of advice to the photographers who turn over the rights to their photos to the many publications and wire services who are taking them away without much resistance from many of the photographers). I currently want to find part-time work with a publication of some sort or a business with some connection to the media, such as being a picture editor or assistant director of photography. I have accumulated a tremendous amount of valuable experience over the many years I have work experience that could be put to good use in the right situation. I would also like to become involved in some way with trying to help people who are faced with the same things I have been faced with--- dealing with the emotions of having a brain tumor or having seizures. It could be something as simple as having someone to talk to. I wish I could do more, such as people like my neurosurgeon Dr. Holland, who deals with life and death everyday. He is someone who is doing one of the really important things in life. When you compare that to covering sporting events, many things become very clean. I would like to contribute, in some way, to making the world a better place. I have been searching for answers this past year. My life totally changed after that split second on November 12, 2000. I have received so many gifts in my life from that moment in time. I am looking forward to the future and what it will hold for me. I want to continue to live in the present and to appreciate the things that are right in front of me ---things that we often do not take the time to see and appreciate. It feels really good to write down my feelings right now, just as I did a year ago in Sports Shooter, and see the focus of my life become clearer.